The books that comprise the Bible are referred to as the canon. But how do we know that the early Church got the canon correct? Perhaps you have heard the myth that certain early Christians got together and voted on which books should be in the canon, and that some books only passed by a single vote! Let’s get something straight right away. The Church does not determine the canon at all. The Church discovers the canon. The canon is the collection of books that were written by divine inspiration and are therefore part of God’s Word. We cannot, by voting or any other means, make a book become inspired by God if it isn’t! Nor can we, through any action of our own, cause a divine book to cease to be inspired by God. A book is either inspired by God or it isn’t. Our opinions, actions, and votes, have no effect on the canon. Rather, our task is to discover which books have been inspired by God. But how was this done, and can we be sure it was done correctly? Why is the Gospel of John included in the Bible, but not the “Gospel of Thomas?” Moreover, some printed English Bibles do contain books that others lack such as Tobit and First and Second Maccabees. These extra books are called the Apocrypha. Are they part of God’s Word, and how do we know? To correctly discover which books are part of the Bible, we need only apply the same method we used to discover that the Bible itself is authentic, accurate, and divine. We look at the number of ancient manuscripts available and the timescale between their writing and discovery to assess the authenticity of the text. We see whether the text is corroborated by the most authentic eye-witness historical accounts (especially other books of the Bible) to assess its accuracy. To discover whether the text is of divine origin, we look for internal evidence, such as its self-attesting claim to be the Word of the Lord, its consistency with the other Scriptures, and its ability to justify human knowledge. Consider the so-called “Gospel of Thomas.” Is this work authentic? (1) Was it really written by the Apostle Thomas and (2) is it divinely inspired? Good evidence for authenticity would be a large number of ancient manuscripts. Yet the Gospel of Thomas has only four, and the oldest three Greek manuscripts are fragmentary. Contrast that with the 25,000 ancient manuscripts of the books of the New Testament. So the book simply does not compare to the biblical books in terms of authenticity. Moreover, the book seems to date from the second century which makes its authorship questionable. What about accuracy? Does the Gospel of Thomas corroborate with the other, more authentic books of the time? Fortunately, we have four very detailed and highly authentic accounts of the Gospel (Matthew, Mark, Luke, and John) which show agreement with each other. But they contradict Thomas in a number of places. For example, according to the Gospel of Thomas (13) Jesus supposedly states, “I am not your teacher…” Yet in the authentic Gospels Jesus affirms that He is their teacher (John 13:13; Matthew 23:8, 26:18; Mark 14:14). Since revelation from God must be self-consistent, there can be no doubt that the Gospel of Thomas is not Scripture. But the genuine Scriptures manifest their divine source by their rigorous consistency and common focus. Books that falsely attribute authorship to a biblical author are called the “pseudepigrapha.” The term essentially means “false writing” indicating that there is evidence that the authorship is false. A number of such books claim to have been written by various biblical figures, presumably to gain an instant readership. The Apostle Paul apparently had to deal with such false writings in his own time – letters that were falsely attributed to him (see 2 Thessalonians 2:2, 3:17). The books of the pseudepigrapha to which we have access today include the books of Adam and Eve, the Apocalypse of Abraham, the Testament of Moses, the book of Enoch, the Testaments of the Twelve Patriarchs, the Lost Gospel according to Peter, the Gospel of Phillip, and the first Gospel of the Infancy of Jesus Christ, to name a few. Like the Gospel of Thomas, these works do not have the characteristics of Scripture. They lack the authenticity, accuracy, and corroboration enjoyed by the biblical canon. In most cases, there is evidence that the books were written far later than the time in which their supposed author lived. These books were never considered part of God’s Word by the early Church. Christians recognized that these works are not inspired by God. What are some other criteria by which we can discover which books are part of God’s Word? For many Old Testament books, the task is quite easy. Consider that Jesus, who demonstrated that He was God in the flesh by His resurrection, often quoted from the Old Testament as the Word of God. Obviously, any book of the Bible that Jesus quoted from as Scripture must be Scripture since Jesus is the God that inspired the Scriptures in the first place! To name a few, Jesus quoted from Genesis (Matthew 19:4-5), Exodus (Matthew 15:4), Leviticus (Matthew 22:39), Numbers (Matthew 5:33), Deuteronomy (Matthew 22:37), Isaiah (Matthew 15:7), the Psalms (Matthew 22:44) and many others. This confirms that these books are part of the canon. But what about books that Jesus did not cite? There are a few Old Testament books, such as Esther and Lamentations, that Jesus did not quote as Scripture (or at least, we have no written record of Him quoting these books). And, of course, the New Testament had not yet been written during Christ’s earthly ministry, so He obviously didn’t quote from it. How can we know that these books are inspired by God? Jesus actually pre-authorized the New Testament. He promised to His disciples that the Holy Spirit would teach them and would help them remember what they had seen and heard, and would disclose information to them about things to come (John 14:26, 15:26-27, 16:12-15). In effect, Jesus was authorizing His Apostles to write the New Testament, and indicated that it too would be inspired by the Holy Spirit just as the Old Testament was. These New Testament books show the same self-consistency and common theme as the Old Testament, indicating that the same divine mind is behind them all. The New Testament quotes many of the books of the Old Testament as Scripture, giving even further self-consistent verification. We have already seen that biblical books are uniquely authentic, far above other ancient literature. God seems to have sovereignly controlled history such that we have amazing manuscript evidence for Scripture unparalleled in the secular world. Furthermore, we apply the biblical criterion that genuine revelation from God must be consistent with previous revelation (Deuteronomy 13:1-3, Galatians 1:8-9). The book of Isaiah, for example, is fully consistent with the book of Genesis, and has the same self-attesting authority. Both are inspired by God. So even biblical books that were not quoted by Christ (as far as we know) still show evidence of divine inspiration by their consistency with previous revelation, and by the same accuracy and high authenticity as other biblical books. The Scriptures also demonstrate their divine authority by the internal testimony of the Holy Spirit. Those people whom God has saved come to know their Savior. They recognize His voice (John 10:27). Suppose you had a close friend who often wrote to you. But an enemy attempted to trick you into doing something by writing a letter and falsely signing your friend’s name. The longer the letter, the higher the probability that you would discover the subterfuge. The style of the letter, the handwriting, the figures of speech, and other nuances simply are not true to the way your friend writes. The more familiar you are with the real thing, the more easily you can recognize a counterfeit. Christians recognize God’s Word because we know God. When we read the Scriptures, the Holy Spirit confirms in the core of our being that we are reading the words of our Lord. Of course, the better we know God, the better we recognize His Word. So, as we grow in Christ we are better able to distinguish inspired books from non-inspired books. When the New Testament was being written, faithful believers recognized it as the consistent fulfillment of the Old Testament. The facts surrounding the life of Jesus were precisely what the Old Testament required; therefore, anyone who accepts the Old Testament as God’s Word should receive the Gospel of Christ (Acts 17:10-11). Despite what critics sometimes allege in ignorance, there was very little doubt in the early Church about which books were from God. The 66 books contained in our modern English Bibles are the books that the early Church recognized as the Word of God. History confirms that early Christians did not consider books like the Gospel of Thomas to be Scripture. They could spot a counterfeit just as we can today. The agreement of Christians in the early Church itself constitutes evidence that we have correctly discovered the canon. But what about the Apocrypha? These consist of various Jewish writings that were compiled in the third century B.C., after the last Old Testament book but before the New Testament. Some are stand-alone books, such as Judith or 1 and 2 Maccabees. Others are additions to existing books of the Bible – adding extra verses or chapters to books such as Esther, Daniel, and the Psalms. The Roman Catholic Church claims that most (not all) of the books of the Apocrypha are part of Scripture and refer to them as deuterocanonical (a second canon), whereas Protestants reject these books. The bottom line is that the Apocrypha does not have the marks of inspiration associated with Scripture. The Apocrypha was never quoted by Jesus or by the New Testament authors. There is no evidence that the first century Church considered the Apocrypha as Scripture. Significantly, most of the books of the Apocrypha do not claim to be inspired by God, and lack phrases such as “Thus saith the Lord” which are ubiquitous in Scripture. The apocryphal book Ecclesiasticus specifically denies being infallible (and therefore God-breathed) in the prologue where the authors ask for forgiveness of any shortcoming in the wording. 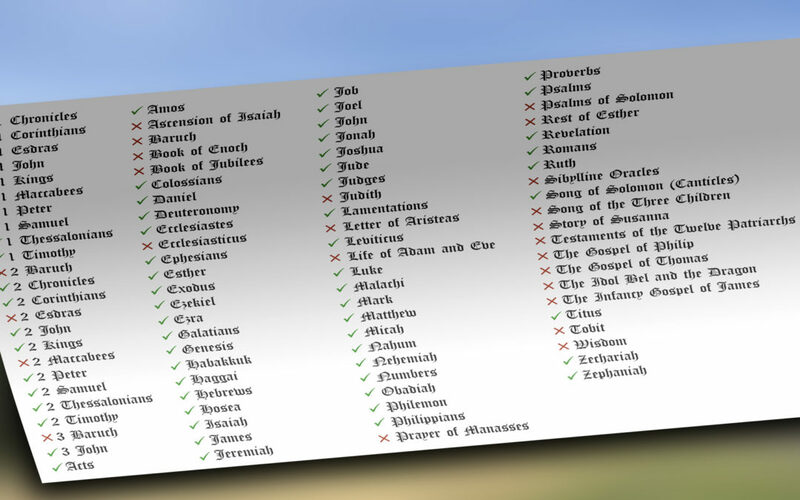 Early lists of the biblical books do not include these books; the Apocrypha only began to appear in lists of biblical books in the late fourth century. The Jews did not accept the Apocrypha as Scripture. And most importantly, parts of the Apocrypha contradict the Scriptures. As such, they fail the test of divine inspiration. The apocryphal book Judith 1:5-7 refers to Nebuchadnezzar as king of the Assyrians. In reality, he was king of Babylon as the Bible affirms throughout (e.g. 2 Kings 24:1; 2 Chronicles 36:6; Ezra 2:1; Nehemiah 7:6, Esther 2:6, Jeremiah 27:20, Daniel 1:1). Why then do some Bibles include these writings? One of the reasons seems to have been because later versions of the Septuagint included the Apocrypha. Recall, the Septuagint is the Greek translation of Jewish writings, including the Old Testament. Most early Christians could not read Hebrew, and used the Septuagint translation of the Old Testament. It seems that many people falsely concluded that these extra books were part of the Jewish canon (even though the Jews did not accept them as canon). Since they are included in the Septuagint which was cherished by many Christians, Jerome translated and included the Apocrypha in his Latin translation – the Vulgate. Jerome was well aware that the Apocryphal books were not part of the canon. In fact, Jerome himself coined the term “Apocrypha” to describe these books: a term meaning “hidden.” He included them for the sake of completeness since they were in the Septuagint (though not in the Hebrew canon). Though not inspired by God, these books do have some historical interest. First Maccabees, for example, recounts some of the history recorded in the book of Daniel (though Maccabees was written a century later). The Vulgate became the cherished translation for Latin speaking Christians, which may have contributed to the continuation of the belief that such books were part of the canon. The Roman Catholic Church in particular relied very heavily upon the Vulgate, which partially accounts for why they continue to include some books of the Apocrypha. The King James Version of Scripture also originally included the Apocrypha. However, the Apocrypha bears none of the distinguishing characteristics of Scripture. The early church did not consider it canon, nor did the God-fearing Jews before the coming of Christ. Christians who embrace salvation by faith in Christ alone have consistently recognized the biblical books as God’s Word, and non-biblical books as counterfeits, thereby confirming John 10:27. We need to remember as well that God is sovereign over history. He has ensured that His children have discovered those books that He inspired. The consistent, self-attesting, witness of the 66 books that we call the “Bible” show it to be truly the one-and-only written Word of God. It is crucial to note that Jesus quotes Scripture as Scripture – as the authoritative Word of God. Simply quoting a text does not imply that the text is inspired by God. Jesus occasionally quoted and critiqued non-biblical sayings (e.g. Matthew 5:45). But when Christ quoted the Bible, He took it as the authoritative truth (e.g. Matthew 4:4, 15:4). What the Bible says is what God says. Note that the three ways in which the Holy Spirit would guide the Apostles match the three types of literature in the New Testament. The Holy Spirit would teach them (the epistles), would bring to their remembrance all that Christ had said (history – the Gospels and Acts), and would disclose things to come (Revelation). The exceptions are 2 Esdras and Baruch. However, both Protestants and Roman Catholics recognize that the books of Esdras are not part of the canon of Scripture.